Rachel earned her Master of Science in physician assistant studies from the University of Alabama in Birmingham and a Bachelor of Science in chemistry from Auburn University. Her previous experience includes working as a physician assistant for a multi-state dermatology group as well as an orthopedic practice, where she assisted with a wide variety of surgical procedures. 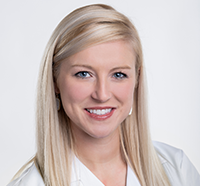 Rachel’s depth of prior experience allows her to play an integral role on our team diagnosing and treating everything from common dermatological conditions to skin cancer as well as better educating our patients on caring for and protecting their skin. Rachel is also a member of the American Academy of Physician Assistants.